Day 197: Why so red? I recently blogged about the Montsouris reservoir and if you look back again at the accompanying photo, you would notice a fountain from which water is flowing freely at its centre. Named Wallace fountain after its generous donor, Sir Richard Wallace, there are over 60 of these fountains around Paris to provide free potable water in public spaces from spring to autumn. Normally dark green in colour, imagine my surprise when I came across one today that’s fire-engine red! 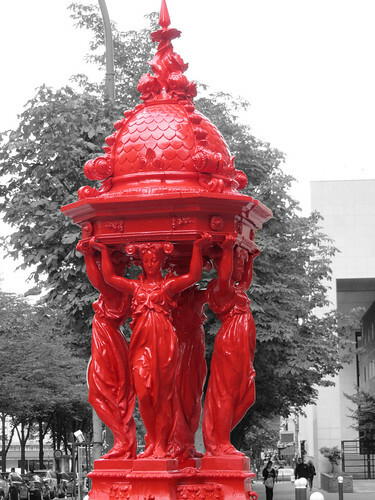 Mais bien sûr, this particular fountain is situated in the heart of Chinatown area, and this is the one colour that Chinese loves most. Perhaps the residents nearby feel they require the fountain to “fit in”, culturally speaking? Personally, I’d rather they be dark green than red.